Sometimes the best recipes come out of nowhere, and without much planning. It’s even better when they require little to no preparation and can cook themselves in a slow cooker while you go off and enjoy a day with your favourite peeps. Am I right? Last weekend I took a desperate look in my fridge, trying to come up with something to cook for dinner that wouldn’t require a trip to the store for additional ingredients. I scored some chicken breasts in my freezer and knew that these had to be the starting point. A quick scan of the kitchen and pantry turned up celery, sweet potatoes, carrots, onions, mushrooms and some cans of beans and tomatoes. Hello chili! Since I was using sweet potatoes and chicken my goal was to create something that was less heavy on the tomatoes, and a lot brighter in flavour while still tasting like a chili. The chipotle hot sauce is what brings the smoky flavour, but you could definitely make this with just some regular chili spice or a pinch of chili peppers. How much you use really depends on how spicy you want your dish to be. If you’re cooking for kiddos, remember, it’s easier to add spice individually at the end, but a lot harder to make things less spicy. 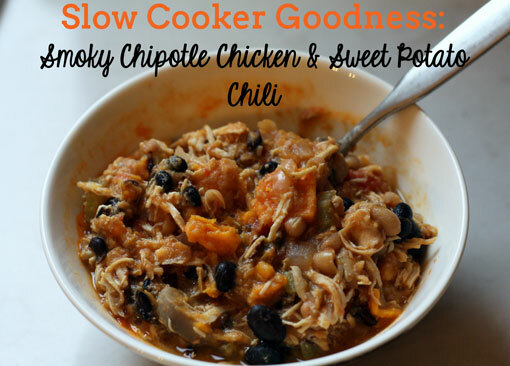 This chili uses sweet potato (chock full of carotenes), two types of beans (fibre, protein and antioxidants), chicken breasts (lean protein), and other vegetables making it a nutritious meal all on its own. You could serve it over some brown rice, but I’ve been enjoying it over a bed of baby kale with a little sheep cheddar grated on top. Yum! If you don’t have a slow cooker, plan to cook this in a heavy bottomed pot (preferably a Dutch oven) in an oven set to 325 degrees for approximately 1.5-2 hrs. This is just an estimate, so budget extra time and plan accordingly. 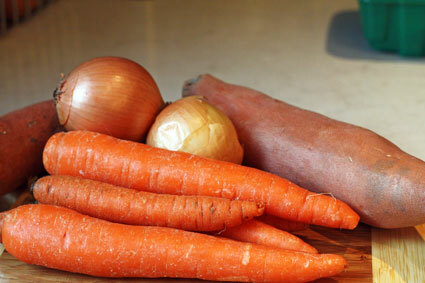 Step 1 – Add whole chicken breasts, all chopped vegetables, beans, and can of tomatoes to your slow cooker. 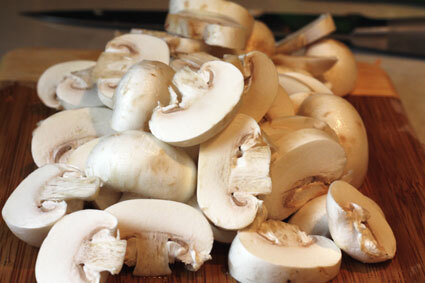 Set to low and cook for 5-6 hrs (slow cooker cooking times can vary – if your unit runs hotter cooking time may be less). Step 2 – After a few hours of cooking, add ground cumin and hot sauce. Stir and continue cooking. Step 3 – Once chicken is cooked through, remove from slow cooker and shred using 2 forks then add it back to the pot of chili. Everything might look a little watery at this point, but once you add the shredded chicken back in and stir it up that will change. Juice your lemon and add to chili. Taste and add salt and/or extra hot sauce as needed. Serve on top of baby kale or spinach (or just throw a whole bunch right into the pot! ), or some cooked brown rice. 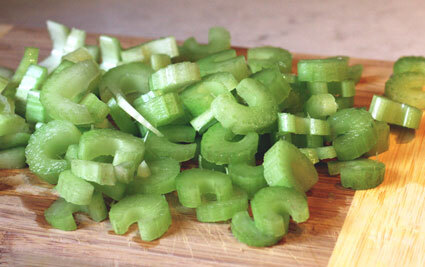 Garnish with avocado slices and a little grated sheep or goat cheddar if you like. Or don’t, and it will still taste great! This makes great leftovers and freezes well, so package some up in individual servings to grab for easy lunches or emergency dinners!